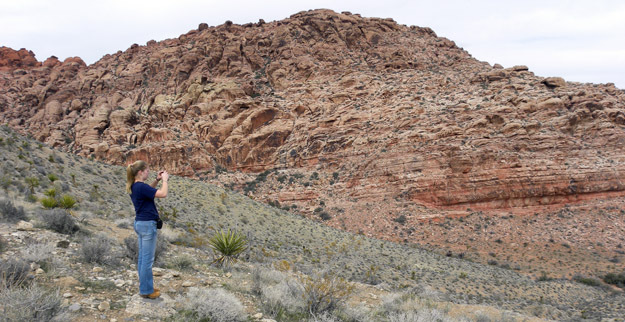 LAS VEGAS, NEVADA–After our long flight we drove our three vans a few miles west of Las Vegas to visit the spectacular Red Rocks National Conservation Area. Greg Wiles and I were astonished to see how much construction had taken place there since we last visited in 2005. The visitor center is completely new, and the scenic roads have been redone. We also learned that on a warm Saturday afternoon in March, the place is filled to capacity with people. The main attraction for geologists is the vivid red rock, which we know as the Aztec Sandstone (Jurassic). It lies below a gray Paleozoic section which makes up the bulk of the Spring Mountains. (I did my dissertation on some of those rocks back in the day.) The Paleozoic dolomites and limestones have been thrust over the Jurassic sandstones. The Aztec Sandstone with overthrust Paleozoic rocks as seen from the visitor center. The sandstone itself has many geological mysteries embedded into it, not least is the pattern of reds, oranges and whites seen on the outcrop. Wooster junior Megan Innis photographing the Aztec Sandstone. Somewhere some geologist must have explained the following contorted beds in the Aztec! 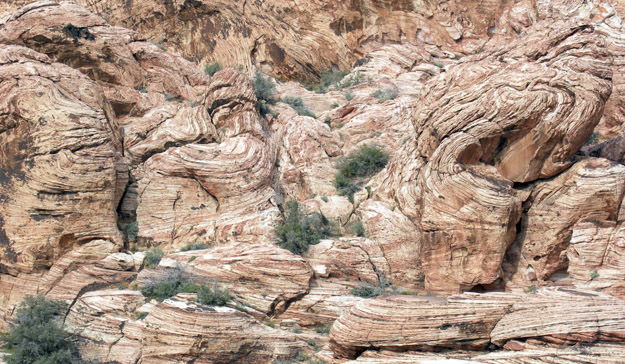 Contorted bedding in the Aztec Sandstone. The units is thoroughly cross-bedded otherwise, revealing its origin as a set of ancient sand dunes. At the end of this long day we arrived safely at the Desert Studies Center in Zzyzx, California. More later!